Vs 3 Multiple nations would be involved in the destruction of the city. Vs 4 The walls and towers of the mighty city were to be broken down. Vs 4 Dirt was to be scraped off the area revealing the underlying rock. Vs 12 The debris of the city was to be dumped into the water. Vs 14 It would be a place for fishermen spreading their nets. Vs 14 The site would not be rebuilt. Well, those are very strange things to say would happen to a city, especially that its building materials would be thrown into the sea! We know from reliable historical accounts what happened next. King Nebuchadnezzar of Babylon attacked the city, breaking down its walls. 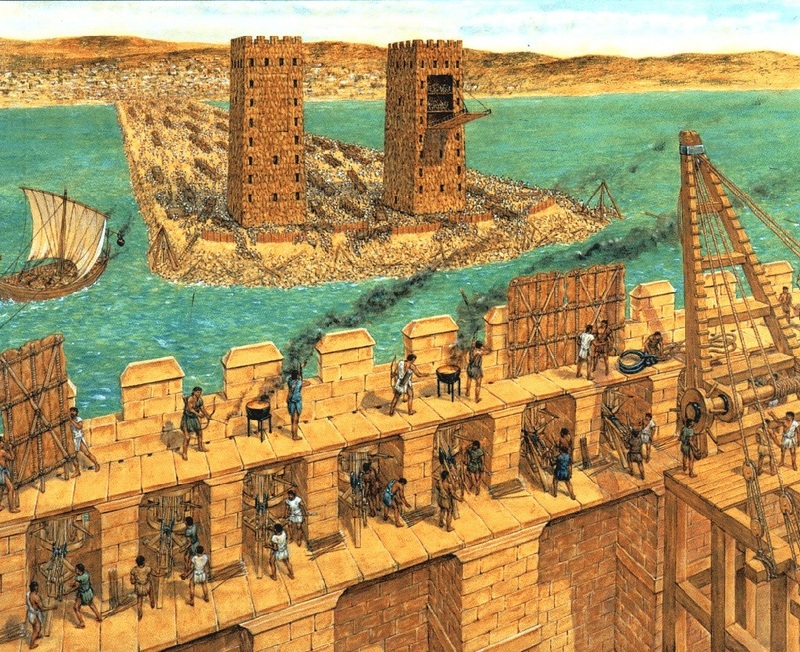 But the leaders of Tyre fled on boats to a large, well-fortified, island a half mile out in the ocean. This island was surrounded with thick stone walls one-hundred and fifty feet high.There they were plentifully supplied with fresh water and food. From there they were able to fend off the Babylonians and so these people escaped. Next, Alexander the Great came through, conquering the region. He also attacked Tyre. The people tried the same trick, fleeing to their island stronghold. But Alexander had a different idea. 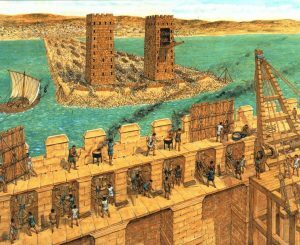 He built a causeway from the shore out to the island by taking all the dirt and stones from the city of Tyre and dumping them into the ocean! The picture shows the ramp and siege towers he built. King Alexander completely destroyed Tyre, capturing all the people. Everything happened exactly as the prophet had said. The city proper was not rebuilt. Eventually a new seacoast city was constructed on the area that had been the island. Posted on November 3, 2018 by dwoetzel.